Kunya-Ark «old castle» was built in the end of 17th century in 1686-1688 by Anushakhan’s son Arangakhan. The total size of the fortress is 130х93 metre. 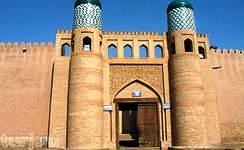 The fortress included a hall for official reception, khan’s office, mosques, mint, as well as many other outbuildings. 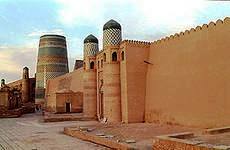 Today, there are only a few buildings of Kunya-Ark fortress: kurinishhona (room for reception of people); Ak-Sheikh Bobo’s cell; the eastern gate with room for guarding; summer and winter mosques and harem. Ak-Sheikh Bobo’s cell was dwelling of Ak-Sheikh Bobo. Later it served as observation tower and a warehouse where gunpowder was stored. Kurinishhona building was built in the years 1686-1688 by Arang Khan. But in the middle of the XVIII century, during the invasion of Iranians it was destroyed. In 1804-1806 the building was erected by Eltazur-khan. Kunya-Ark castle consists of several rooms: ayvan, room with a throne, outdoor courtyard as well as rooms for Khan’s treasure, manuscripts and rooms for rest. Now the throne is in the museum of Moscow. Harem is located in the northern part of the Kuna- Ark, was built during the reign of Muhammad Rahim Khan II. There are many living quarters in the courtyard. Total area of the harem is 33h62 metre. Sheikh Akshih baba’s tower is located near the Kunya-Ark fortress. The main part of the complex was built in the XIX century. During the excavations there were found fragments of pottery and ancient coins of an earlier historical period. Kunya-Ark fortress was built in Uzbek traditions so this magnificent architectural complex is not only a historical monument, but also a work of art.